When you realize that restarting is possible (and perhaps inevitable) you worry less and can treat yourself more gently (not beat yourself up) when you do need to restart. For example, most of my life I've struggled with unhealthy eating habits. I have quite the sweet tooth and the holidays tend to be especially devastating to any healthy habits I'm able to acquire throughout the year. Somewhere between Thanksgiving and New Year's Eve it just becomes normal to have at least a dozen cookies a day. About four years ago, I came across an incredibly reasonable (meaning: plenty of real, hearty, food and only lasting 4 days) detox plan that really worked for me. It reset my palate and eating habits so that I was able to make health changes moving forward without my crazy sugar cravings. Later that Spring, when I somehow became accustomed to having a handful of jelly beans for breakfast every morning, it worked again. Having this reset tool in my pocket helped me make small healthy changes without worrying about maintaining them and it continues to keep me from beating myself up when I do fall into unhealthy eating patterns. 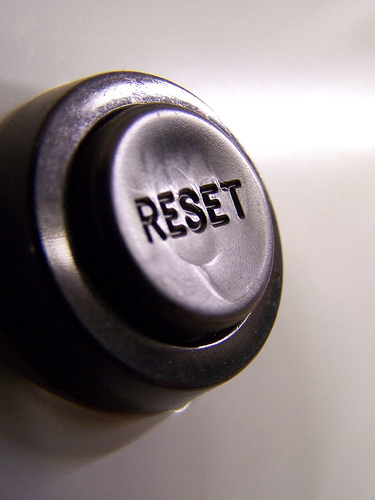 I bring up this idea of having a reset tool because I've been facing some challenging conversations. I'm noticing how much of my anticipatory energy goes into worrying about the conversations becoming too intense and not going well. I'm realizing the need for a reset tool (or two, or more) so that I can go into these conversations with courage and calm. When conversations become intense, ours stress responses engage. As our blood pressure and heart rates rise, our ability to listen, think, and speak clearly decrease. Taking a break by talking about something else, something totally benign, for a moment or by physically getting some distance allows you to calm down and process how you're feeling at the moment. Just be sure to share a clear expectation as to when the conversation will resume. In my experience, conversations tend to escalate and spiral out of control when one or both parties doesn't feel like they're being heard and their feelings are being discounted or dismissed. When interactions start going this way, try to do nothing but listen for and acknowledge feelings for the next five minutes - both the other person's and your own. Why not try some radical honesty by just saying, "I'm feeling frustrated (concerned, disheartened) by the way this conversation is going. How are you feeling about it?" Finally, something you both agree on - this conversation isn't going anywhere and it's not going well! Bringing this fact out into the open gives you the opportunity to work together as partners to figure out what you need to better communicate. Then you can get back to the original issue with a mutually developed approach. My sincere wish for you, today, is that you are able to boldly enter into challenging, but important, conversations armed with these reset buttons to give those conversations a fresh start. And if you will be in the Pittsburgh area on Groundhog Day (February 2nd), I also sincerely wish that you will consider attending my upcoming workshop designed to address the challenging conversations you are currently facing: Writing Your Relationship Resolutions. Hope to see you there!